Conflict Resolution – Getting along in the Workplace provides all the training tools you need to professionally deliver training. Teach your employees and supervisors the importance of communication, how to recognize conflict resolution styles, develop intervention techniques and start building staff trust to effectively get along in the workplace! Seeing is Believing This sample manual to teach Conflict Resolution: Getting Along in the Workplace is in MS Word format. Conflict is something that is inevitable. Getting along in the workplace is essential to ensuring everyone is able to do their part and master their own roles and collaborate as a team when needed. All of us experience conflict. We argue with our spouses, disagree with our friends, and sometimes even quarrel with strangers at a sporting event. At times we lose sight of the fact that all this conflict is normal. So long as people are individuals there will be the potential for conflict. Since you can't prevent conflict, the most important thing is to learn how to handle or manage it in productive ways. What is critical for resolving conflict is developing an understanding of, and a trust in, shared goals. It requires openness, discipline, and creativity. Showing respect for other people and not blaming them enables people to work for mutual benefit. Many times Conflict in the workplace is awoken because people’s ideas are dismissed, put down and criticized, then put to the wayside. Brainstorming ideas is a key component to conflict resolution. Ensure everyone on the team has a chance to voice their opinion. Suggestions can be weighed with decision making matrices to make sure that the best ideas are chosen for any given project or team assignment. Another huge conflict in the workplace involves trust and morale. If co-workers cannot trust each other, it’s hard to work together. This causes friction between the workers, usually resulting negatively around the workplace. When negativity is in the workplace, it spreads through everyone, decreasing productivity, increasing stress and can result in a hostile work environment. This training content will help strengthen trust and morale of your co-workers so everyone can start getting along in the workplace! Conflict Resolution – Getting Along in the Workplace Training Material is designed to develop communication strategies, recognize the five most common conflict resolution styles and when to use them, build confidence for conflict management and effective intervention techniques and much more! Velsoft Training Material is built to save you time, energy, money and your sanity. Make deadlines disappear, stretch your budget and alleviate your stress and focus on training! Conflict Resolution is available as an individual title, save more with our training bundles, or offer as an eLearning or blended-learning opportunity for your organization. Want to see the topics you will cover in this course? 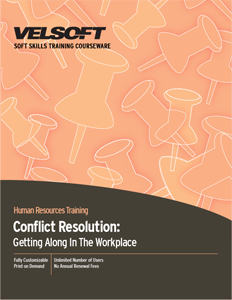 Check out the Conflict Resolution – Getting Along in the Workplace Course Outline!